Barnes and Oscar Mojica waged war at Madison Square Garden. THREE-TIME IRISH Olympian Paddy Barnes says he’ll “probably retire” from professional boxing after suffering a shock split-decision defeat to Oscar Mojica on his US debut at Madison Square Garden’s Hulu Theater. The unheralded Texan Mojica, previously 11-5 with just one KO, scored what appeared to be a legitimate knockdown in the second round only to see it ruled a push by referee Danny Schiavone, but he was still awarded the contest on split scores of 58-56 x2, 56-58. Barnes, the naturally smaller man on the night, was battered and bloodied but fought gallantly, frequently bringing the 4,000-strong, Irish-heavy crowd to its feet. Despite moving up two divisions from flyweight to bantamweight, Barnes had been expected to take care of business against rank outsider Mojica in a bid to rebound from last summer’s stoppage defeat to Cristofer Rosales in a world title fight in Belfast. Instead, he was well beaten and saw his professional record drop to 5-2 (1KO). In the first round, he broke my nose. And to be honest, I don’t know how the judges scored it close because I thought he won every round. I’m too small for bantamweight, but to be honest with you, I’ll probably retire now. Is there any point in boxing on after a fight like that? “The fans are great, like, but at the end of the day it’s my health and all. If I’m going to box like that, there, what’s the point in boxing on? I strongly think this is it. I always thought if I lost again, I’d retire. The fight wasn’t even close. I thought he won every round. Barnes walked out to tune of U2′s ‘Sunday Bloody Sunday’, which in itself got a rapturous reception before the sizeable crowd even realised it was a fighter’s entrance music. Walked to the ring by close friend Carl Frampton among others, and cheered on by Irish WWE star Balor at ringside, it was the Belfast man who found himself bloodied within seconds. A right hook by Mojica bust Barnes’ nose, painting his face red for the remainder of a testing opening round in which both men enjoyed their share of success. The second was an absolute war. An assault to the body, with Mojica delivering a ferocious left hook south of Barnes’ rib cage, sent the Irishman staggering backwards before he slumped to the canvas, grimacing, under the Texan’s weight. It was as legitimate a knockdown as the night is long, but incredibly the man in the middle ruled it a push on behalf of the justifiably furious Mojica. Thankfully for the Texan, it didn’t prove costly in the end. A belting encounter played out from there, Barnes occasionally coming to life and firing back in threes and fours to the guttural approval of those in attendance. But he seemed to be constantly chasing the contest instead of leading it. For every ‘Go on!’, there were two or three gasps as the physically larger and stronger Mojica landed at will, redecorating Barnes’ face with blood from his nose during almost every stanza. The self-styled ‘Leprechaun’ nearly took the roof off, and Mojica’s head with it, by way of a thudding overhand right in the closing stages, but didn’t really come close to finding a finishing blow. A thrilling encounter was awarded to the correct victor, with the Irish audience only half-heartedly booing the decision. A thrilled Mojica, meanwhile, paid his dues to Barnes. “It was really important for me [to hurt him with that body shot], even though they didn’t count it as a knockdown. It gave me confidence. I knew I could hurt him throughout the other rounds. I got a little away from my gameplan, but I stayed sharp for the most part. I deserved to win. If I win here in New York, Madison Square Garden, St. Patrick’s Day, and I came out with the win, it was because I deserved it. I give the most credit to Paddy Barnes. He’s a great fighter, ex-Olympian. He had an amazing career. Email “Paddy Barnes will 'probably retire' after suffering shock defeat in US debut war”. 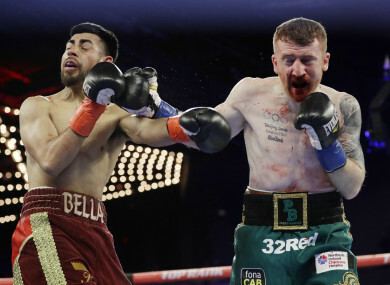 Feedback on “Paddy Barnes will 'probably retire' after suffering shock defeat in US debut war”.